When it comes to grandfather clock service or repairs, we come to your home or office with our complete mobile clock shop. We will set up a shop right in your home or office, remove the movement, clean the movement, re-oil and re calibrate the movement. We also will level your clock. We will clean your entire clock and when we leave, your clock will look and run like new. Contact us today to set up an appointment. We take great pride in our service techniques. When we come to your home or office to repair or service your grandfather clock, we will set up a small repair shop right there in your home or office. We will lay down coverings to protect your floors, set up a table and work area and provide you with the most professional service in the clock repair business. Our technicians will always wear protective gloves when working on our customer's clocks. Your grandfather clock is made up of several components. The movement is the "engine" that drives the hands and makes the clock chime and strike. Just like the engine in your car, your movement needs clean oil to run properly. Most manufacturers recommend that you re-oil every 2 to 3 years and have the clock movement cleaned every 10-12 years. Clock Repair Service and Sales is an authorized Howard Miller Service and Sales Center. Come by our shop or call for additional sales on all Howard Miller and Ridgeway clocks, including all grandfather clocks. Clock Repair Service and Sales also Sells clock oil, clock oil kits, keys and many small clock parts for your modern Grandfather clock. 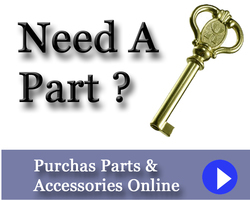 Click here to purchase parts. If you don't see what you need, please call our shop if you have any questions. Please let us know what your clock is or is not doing, as well as the brand name and age if possible.